Tehran: Iran on Saturday welcomed steps towards detente between North and South Korea but warned that the United States was unqualified to play a role since it did not “respect its commitments”. 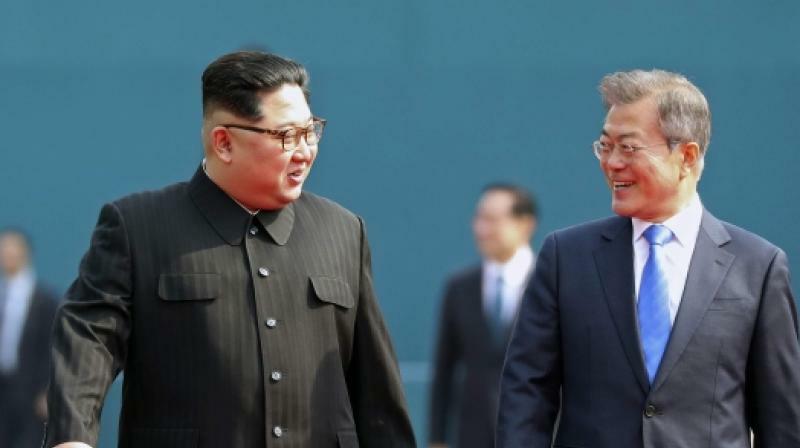 The foreign ministry said the meeting between North Korean leader Kim Jong Un and the South’s President Moon Jae-in was “a responsible and effective step towards regional and global stability”. But ministry spokesman Bahram Ghasemi said the “historic new page for detente on the Korean peninsula” should be worked out between the two principal parties, without the “interference of foreign countries”. “Iran’s experience over 40 years, in particular with regard to the nuclear deal, is that the American government is not a dignified, trustworthy actor and does not respect its international commitments,” Ghasemi said in a statement. Iran signed a deal in 2015 with the United States and five other world powers, curbing its nuclear programme in exchange for sanctions relief. But Tehran argues the US has continued to block its trade with the outside world -- in breach of the deal -- and US President Donald Trump has threatened to abandon the agreement entirely when it comes up for renewal on May 12. “As a result, (the US) is not qualified to play a role to determine the arrangements between countries, which has again been reinforced in recent years by Trump,” Ghasemi said. The leaders of North and South Korea held a historic meeting along their border on Friday, vowing to pursue a peace treaty and the complete denuclearisation of their divided peninsula.